Well, not “new” new, but new to us at least. Mary and I went down to the YMCA this morning to play basketball and then swung by Lowe’s on the way home. Lowe’s just happens to be across the street from the main Toyota dealer in town and as we were driving past I noticed this truck out of the corner of my eye and thought I saw a price of $15,000 marked down to something. “Hang on, that seems pretty cheap. I just want to swing back and check that out a minute.” I don’t ever see Tacomas for less than $20k around here. So we flipped around and pulled into the lot. The price was marked $13,000, but I couldn’t see the mileage with the vehicle off. As I had my hands cupped against the window to see inside, a sale man walked over, popped the key out of lock box, and asked if I wanted to check it out. 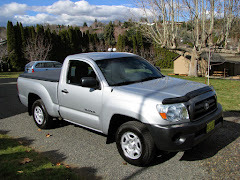 2008 Toyota Tacoma with 78,500 miles. Regular cab, four-cylinder, not four-wheel drive. 20 mpg city, 25 mpg highway. Pretty much the exact vehicle (lowish mileage Toyota) I’ve been wanting for a while as a possible work vehicle (I don’t have any use for four-wheel drive or a V6 engine and would rather have the mileage and a lower sticker price). 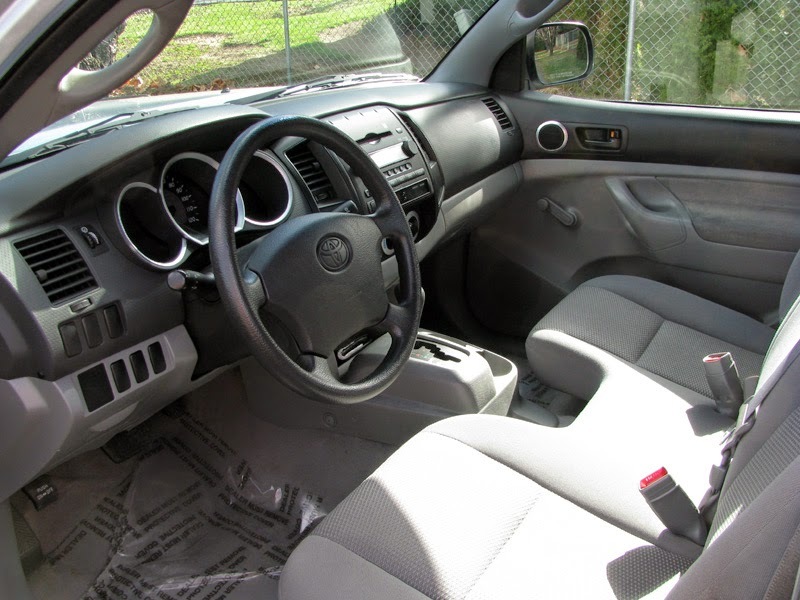 No frills at all, which I love – Mary’s joked with the sales guy that the hand crank windows sold me on the truck. Only thing I would’ve liked even better would’ve been the style from a couple years earlier when the Tacoma was more of a compact truck than a mid-size. 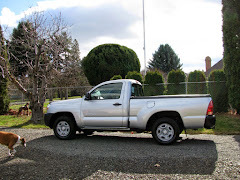 So we took it for a short test drive and Googled the fair market value while we were out driving around. Most sites were coming in around $10,500 for a dealer price. Back at the dealership the salesman pulled a Kelly Blue Book price of $11,400 based on the accessories and also showed us a Car Fax history. I offered $10,500 and after a little back and forth eventually settled at $10,900. Expensive impulse buy! 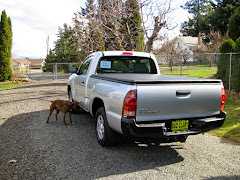 I’m sure we could’ve haggled for less or started at more of a low-ball offer, but I walked out of there happy to pay what we did for a vehicle I really liked that I never see available. This entry was posted in General on Sat 21 Feb 15 by Josh. Nice ride! You probably could have traded in the blue Corolla and knocked the price down a couple hundred more! True. It’s too much of a perfect dog-mobile though. Let me know when you go to trade in your Matrix one of these days – I’ll buy it off you. I’ve got a thing for Toyotas. Keep my Matrix in mind too though–really great little car with the extra fun of stick–just in case. (My eyes, you know . . .) You can start a collection.